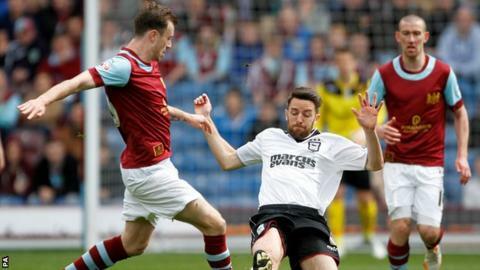 Ipswich Town's play-off ambitions have ended after defeat by promoted Burnley. Realistically, only a victory would have preserved the slim promotion hopes of Mick McCarthy's side but this loss leaves them four points adrift of sixth place with one game remaining. Chances were scarce for either side at Turf Moor. But Burnley earned their 26th win of the term when Michael Kightly rolled in to an unguarded net after Dean Gerken had denied Danny Ings. Given that their Premier League status for next season is confirmed and the title is now out of reach, Burnley might have been expected to allow their ferocious intensity to drop just a little. But that would be to misunderstand the side Sean Dyche has assembled. They were afforded two days off after clinching promotion with victory over Wigan on Easter Monday but the hosts' characteristic desire was not dimmed. Kightly's goal, after 54 minutes, epitomised that. Twice Burnley players won challenges in midfield before Ashley Barnes flicked the ball into the path of Ings. He veered past Luke Chambers and, although Gerken blocked his effort, Kightly was on hand to guide the loose ball into an unguarded net. Until then, clear openings had been scarce for Burnley. Ings posed problems with a couple of efforts from the edge of the area, while Scott Arfield appeared to be impeded by Chambers as he strained to reach a Kightly cross. Indeed, the better opportunities had fallen to Ipswich. Kieran Trippier was forced to divert a Tommy Smith header over his own crossbar and Frazer Richardson volleyed wide after meeting a teasing Daryl Murphy cross. Then, as McCarthy's men chased an equaliser, Paul Taylor's free-kick was palmed wide magnificently by Tom Heaton. Yet for all Ipswich's endeavour to haul themselves back into the game, it was Burnley who came closest to scoring a second goal. Unsurprisingly Ings was involved, meeting Dean Marney's cross and cannoning an effort against the crossbar. "Tremendous credit to our group as it is difficult with all [the celebrations] going on. The focus on the game was absolutely spot on. "I thought our performance was very good up until conceding the goal. We were on top, but we missed that one tackle and it changes the course of the game. "Without doubt, Burnley are outstandingly good value. They have deserved it, well done to them, and they should enjoy it and not listen to all the doom and gloom." Match ends, Burnley 1, Ipswich Town 0. Second Half ends, Burnley 1, Ipswich Town 0. Foul by Ross Wallace (Burnley). Jonathan Williams (Ipswich Town) wins a free kick in the attacking half. Attempt missed. David Jones (Burnley) right footed shot from outside the box misses to the right. Assisted by Dean Marney with a cross. Ross Wallace (Burnley) wins a free kick on the right wing. Foul by Aaron Cresswell (Ipswich Town). Attempt missed. Christophe Berra (Ipswich Town) header from very close range misses to the left. Assisted by Paul Taylor with a cross. Attempt missed. Frank Nouble (Ipswich Town) right footed shot from outside the box misses to the right. Assisted by Jonathan Williams. Corner, Ipswich Town. Conceded by David Jones. Dean Marney (Burnley) wins a free kick in the defensive half. Attempt missed. Frank Nouble (Ipswich Town) right footed shot from outside the box is too high. Assisted by Paul Green with a headed pass. Paul Taylor (Ipswich Town) wins a free kick in the defensive half. Jonathan Williams (Ipswich Town) is shown the yellow card for a bad foul. Foul by Jonathan Williams (Ipswich Town). Corner, Ipswich Town. Conceded by Tom Heaton. Attempt saved. Paul Taylor (Ipswich Town) right footed shot from outside the box is saved in the top left corner. Paul Green (Ipswich Town) wins a free kick in the attacking half. Corner, Ipswich Town. Conceded by Ben Mee. Delay in match Cole Skuse (Ipswich Town) because of an injury. Danny Ings (Burnley) hits the bar with a left footed shot from the centre of the box. Assisted by Dean Marney with a cross. Substitution, Burnley. Ross Wallace replaces Scott Arfield. Offside, Burnley. David Jones tries a through ball, but Dean Marney is caught offside. Attempt missed. Scott Arfield (Burnley) left footed shot from outside the box misses to the left. Attempt blocked. Danny Ings (Burnley) right footed shot from the centre of the box is blocked. Assisted by Dean Marney. Attempt blocked. Scott Arfield (Burnley) left footed shot from the centre of the box is blocked. Kieran Trippier (Burnley) wins a free kick on the right wing. Foul by Paul Taylor (Ipswich Town). Substitution, Ipswich Town. Frank Nouble replaces Stephen Hunt. Substitution, Ipswich Town. Paul Taylor replaces Frazer Richardson. Foul by Junior Stanislas (Burnley).